The Stanton Warriors (Dom and Nick) turned the breakbeats world on their head back in 2001 with the epic Stanton Sessions cd which infused house, garage, and hip hop into a then stagnant breaks scene. Overnight sensations as producers and remixers, the boys have disappeared for awhile amidst label issues and working on the double cd followup Stanton Sessions 2. With that release finally on the horizon, they decided to do a FabricLive. Relevance? 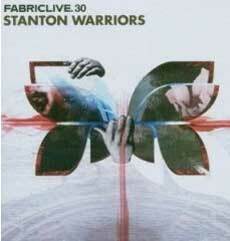 FabricLive 30, while a decent mix, is really disjointed. Plenty of great tracks and remixes pepper it, but that Stanton sound is only there for stretches and is broken up by minimal tracks loaded up with basslines and breakbeats to make them more dance friendly. Overall, it doesn't add up and you end up skipping around the cd depending on whether you wanna hum the melody of Claude Von Stroke's seminal Who's Afraid of Detroit or sing the chorus of Peace Division's Club Therapy, on half of the sound here or wanna shake your booty to the breaks and hip hop infused part of this mix. Most of the cuts here are reworked and re-edited by the Stantons, making this compilation noteworthy in its exclusivity, especially if you find yourself drooling over the tracklist, which you might. But for a lover of the Stanton Sessions, I prefer the bootyshaking breakbeats found later in the cd with their own Pop Ya Virus and Flamed Up by Old School Junx and the vocal stylists of Rodney P on the Deekline & Wizard Remix of the Stanton's Dip & Get Low. But the real gem is the massive breaks track The Machine from Baobinga & ID that the Stanton's add a really smooth acapella over. And that's where they shine, reworking their sound and adding to it, pushing things forward with booty shaking beats making the middle part of this cd a real treat. Then sadly, towards the end of the mix, they head back into remix territory with Freeform Five and King Unique instead of playing to their strengths. Artists take chances with their sound and sometimes they miss. This Jeckyl & Hyde mix is a pretty good example of that because the Stantons never committ to anything soundwise, they just throw alot of dope beats at us and hope it all goes down. The flow just isn't there. Parts go down smooth, but you may end up choking along the way.